Developing countries globally are involved in a complex process of globalization. These countries for making profit of globalization adopt new policies and measurements which have positive and also negative effects on child labor and which have let it to a phenomenon of child labor crisis. Within the framework of convention on the rights of the child, the states parties to the convention are committed to protect children from child labor and economic exploitation. For an effective and practical protection of such rights and imposition of such obligations on the states parties, these new polices and measurements should be considered. This research tries to demonstrate this crisis of child labor in the process of globalization for developing countries. The findings of this research show that the development of proper policies and measurements such as improving household's income, and avoiding improper and wrong measurements such as competitive advantages policy could manage this crisis, and it might lead to decrease child labor in developing countries in globalization era. This study is based on the certain experiments of developing countries and the direct and indirect effects of globalization on the situation of child labor in those countries. This research tries by examining these consequences of globalization also discover guides and recommendation of management of child labor crisis in developing countries in their involvement to the globalization. 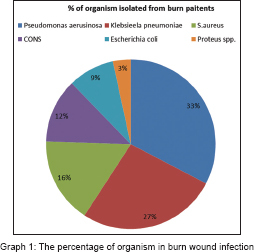 Context: Microbial infection is the most common and the most serious complication of burn injury. It accounts for approximately 75% of all death in burn victims. Burn wound facilitates a favorable lodgment for existence and multiplication of bacteria. Patients with diminished immunity are highly susceptible and at increased risk of developing a wound infection. Aims: To determine the prevalent bacteria causing wound infection and their trends of susceptibility to antibiotics over a period of 1 year in burn cases. Settings and Design: This is an observation 1 year retrospective study conducted in Department of Microbiology and Burn Unit in a Tertiary Care Hospital and Teaching Institute during January-December 2013. Subjects and Methods: During the study, 118 samples were collected and processed. The specimens were cultured using aerobic microorganism techniques. Antimicrobial sensitivity testing to different agents was carried out using the disc diffusion method. Statistical Analysis Used: No. Results: During the study, a total of 118 samples were tested. Out of 118, 109 were found to be culture positive. Out of 109, 34 Gram-positive cocci and 118 Gram-negative Bacilli were isolated. In this study, maximum number of Pseudomonas aeruginosa (40.6%) isolated followed by Klebsiella pneumoniae (33%), Staphylococcus aureus (16%), CONS (12%), Escherichia coli (11%), Proteus (4.2%), member of nonfermenter (3.3%), member of Enterobacteriaceae (3.3%), Acinetobacter spp. (1.6%), Citrobacter spp. (1.6%), and Providencia (0.8%). Different antibiotics were tested against the Gram-positive cocci and Gram-negative Bacilli. Conclusions: In the consequences, the increasing quality of care in burn units and improving treatment opportunities do not lead to a remarkable decrease in the mortality rates. All the related causes are the combination of the rapidly changing microorganism dominating different burn wound infection, their great antibiotics resistance, and the huge cost of treatments. Introduction: The recent events throughout the world have brought about an increase in paying attention to the planning area of study and getting ready against catastrophes. Health care organizations and hospitals have to do their best so that they can face the worst crises. The staffs and leaders can response to these crises by precise planning. The state of preparation and the restrictions should be identified in each hospital so that there would be more preparation to counter the unexpected phenomena by identifying the strong points and removing the restrictions. This article aimed to specifying the status of preparation and the restrictions of the crisis management in the hospitals of Isfahan university of Medical Sciences in 2014. Materials and Methods: this study was descriptive-analytical. The statistic community of this study comprises of the directors and managers of the hospital, the nursing managers and the authorities of the crisis committee of 11th section of educational hospitals in Isfahan. The tool of data collection was a researcher-made questionnaire on 8 scope on the basis of the Likert Scale which was prepared based on the research litrature and the crisis management standards which was approved by experts. Its reliability was calculated 0.7 by cronbach alpha. The data were interpreted by descriptive statistics and Pearson Correlation analysis. Findings: The comparative study of the crisis management restrictions and preparation dimensions on the basis of the hospitals under investigation suggest that there had been a significant difference among the hospitals only in two dimensions of the crisis committee status and the preparation maneuver (P-Value <0.05). Also Command system dimension in critical situations in Amin hospital has had the most average while preparation maneuver dimension in Feyz Hospital has had the least mean. In general, the crisis management restrictions preparation of the hospitals under study has not been significantly different in general (P-Value 0.05). Conclusion: According to the Participants'views the preparation status and the crisis restrictions were at a desirable level and only lack of new technologies have been apparent in the critical situations. Hence, the hospital director not only have to invest more in providing and preserving the new technologies to use in the critical situations, but also to provide some arrangements to educate and empowerment the hospital's staff in order to use these technologies. Background: Hospitals are the last line of defense against losses due to disasters. However, the prerequisite for hospitals to be able to measure up to the challenge is a sensitive, well-informed, and trained hospital staff. This study attempted to evaluate the knowledge, attitude, and practices of staff at a public hospital toward disaster management. Methods: This is a questionnaire-based cross-sectional study conducted at the Government Medical College and Hospital-32, a tertiary care public hospital in India. Questionnaire used for this study was prepared by the study team to evaluate the knowledge and attitude of hospital staff by modification of a questionnaire used for a similar study in South Africa. Results: Hospital staff, in general, was found to be sensitive toward disaster management, but their level of awareness regarding the same was low. Nurses were found to be significantly more informed than other staff whereas doctors were found to have the most positive attitude toward disaster management. Conclusion: Low knowledge regarding disaster management among hospital staff, as shown in this study, can have catastrophic consequences. Policy-makers and hospital management need to spend time and resources on training hospital staff in disaster management. Introduction: India is a country of South Asia. Due to its specific location, it is frequently affected by various hazards and disasters. Objective: In this study, an attempt has been made to discuss the individual as well as comparative hazard's related human deaths in India. Methodology: Data of human casualty of 6 major natural hazards, those are frequently occurring in India have been analyzed using secondary data of 1965-2014. Data were collected from the website of National Disaster Management Authority, New Delhi. For comparisons of human deaths among/between hazards, Kruskal-Wallis Htest/multiple comparisons were used. Results: Floods have the highest number of casualty years (45 years) while earthquake reported minimum events years (19). Median human casualty was recorded, which was the highest by flood (1027) followed by epidemics (265) and extreme temperature (264). Human casualty was highest in flood (31%) followed by storms (25%), earthquakes (24%), epidemics (10%), extreme temperature (8%), and landslides (2%). Kruskal-Wallis Htest, result shows that difference in human casualty distributions among hazards was highly significant (P < 0.001). Conclusion: In India, despite many preventive measures for natural hazards and disasters, its annual, as well as decadal human casualties, are still high. Increasing coping capacity of the people which is a most important ways of reducing vulnerability.